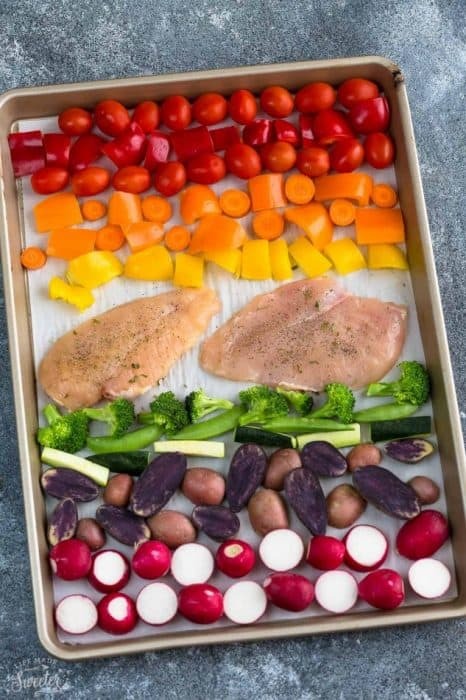 Lemon Herb Chicken Sheet Pan with Rainbow Vegetables – an easy one pan meal perfect for busy weeknights. 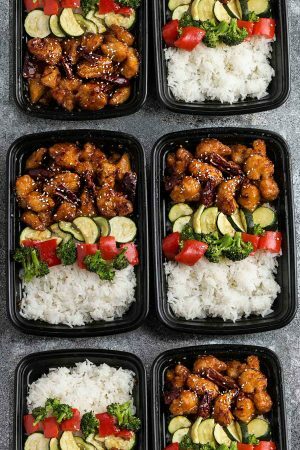 Best of all, so simple customize and great for meal prep! Plus step-by-step video! Sheet pan meals have become a regular thing around here for a while. When my husband and I first got married, we’d get home pretty late from work. Cooking was kind of the last thing on my mind, so I would go rummaging through the fridge and try to find whatever I could that fit on a sheet pan and into the oven it went. Now with our even busier schedule and all the traveling I’ve been doing lately, they are such a life saver. They take hardly any time at all to prep and I love that clean up is a breeze – especially if you line your pan with foil or parchment paper. 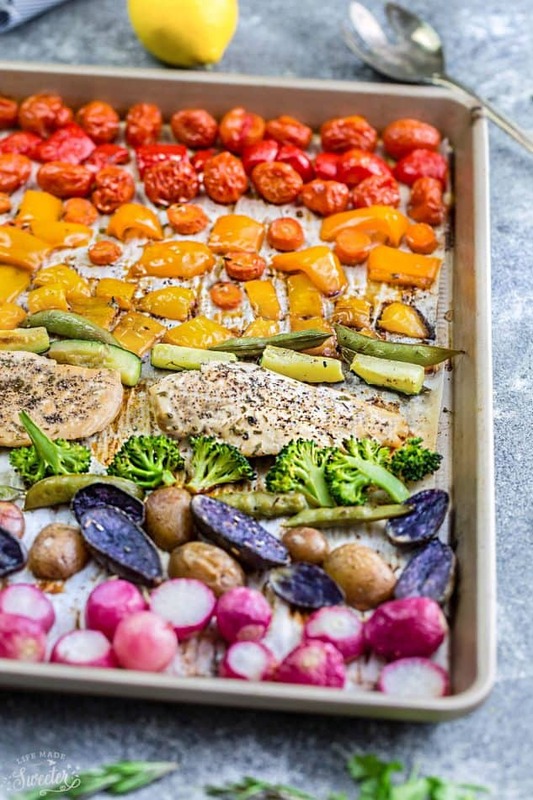 This Lemon Herb Chicken Sheet Pan with Rainbow Vegetables happened back in February and is just perfect for spring. Does it look familiar? If so, that’s because this is just another version of these Rainbow Roasted Vegetables I posted last month. I simply added the chicken for the hubs and my son that same day while I did the photo and video-shoot. So now it’s a complete meal with protein. Plus it comes together easily and the hardest part is just chopping all the veggies. And you totally don’t have to arrange the veggies into a rainbow if you are pressed for time. Just toss your favorite variety together on the pan. Everything gets roasted up for about 18-20 minutes, or until the chicken is cooked through and the veggies are tender. Easy peasy and there’s practically no clean-up! What you get is a simple, healthy and super pretty meal for spring, summer or even this Easter weekend! This Lemon Herb Chicken Sheet Pan would also be fantastic for Sunday meal prep for your work or school lunch boxes. Just divide them into some lunch containers and pair them over with your favorite carb – cauliflower rice, quinoa, rice or pasta. 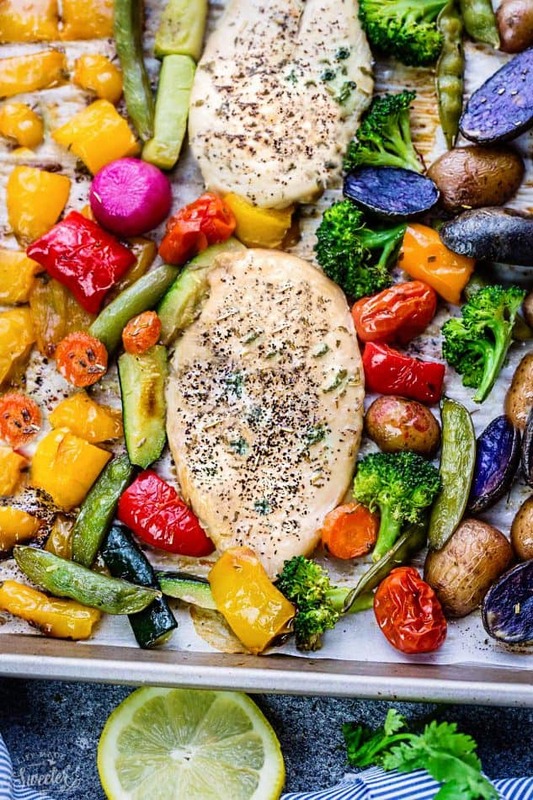 Lemon Herb Chicken Sheet Pan with Rainbow Vegetables – an easy one pan meal perfect for busy weeknights. Your favorite cooked carb - quinoa, rice, farro, pasta, noodles, cauliflower rice, roasted sweet potatoes etc. Preheat oven to 400 F. Grease a large baking sheet with oil or line with parchment paper or aluminum foil for easier clean up. 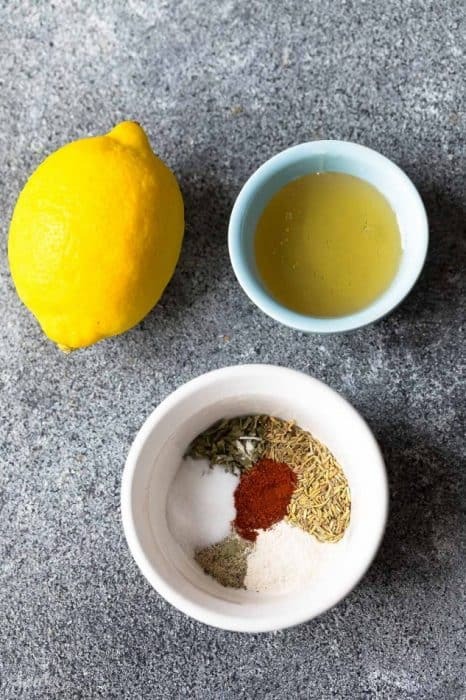 In a medium bowl, combine the lemon juice, lemon zest, olive oil, honey and seasonings. Pour 1/2 into a large resealable zip-top bag and add chicken. Seal tightly and rub marinade into chicken. 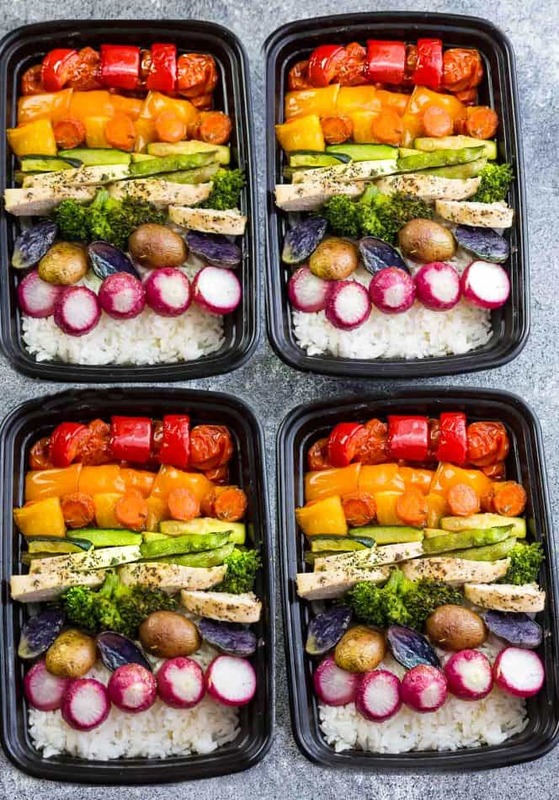 Add chopped vegetables separately (according to the colors of the rainbow if you want to arrange them like I did - if not just add them all together) to the bowl with the remaining marinade (reserving 1-2 teaspoons for topping chicken at the end). 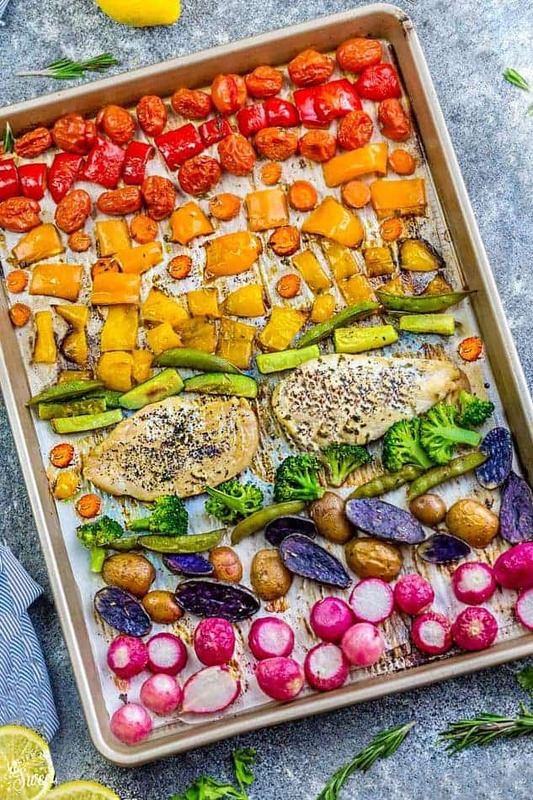 Toss vegetables and arrange onto the prepared sheet pan, either in separate rows according to colors of the rainbow, or any way you like. Add chicken to the pan and bake in oven for 8 minutes. Toss vegetables and flip chicken, then return to the pan to bake for another 10-12 minutes, or until the chicken is cooked through (depending on how thick your chicken is - I pounded mine to pretty thin pieces so they cooked fast). Drizzle with reserved marinade. 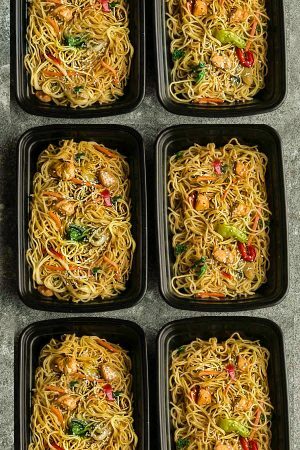 Serve hot with your favorite side or if meal prepping, divide into lunch boxes.